The SOHO LASCO C2 instrument captured this image of the Earth-directed coronal mass ejection or CME. SOHO's coronographs are able to take images of the solar corona by blocking the light coming directly from the Sun with an occulter disk. The location of the sun is indicated by the white circle. Image obtained on August 20, 2013. 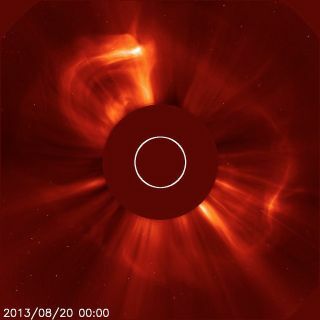 The sun unleashed a powerful storm early Tuesday morning (Aug. 20), sending an enormous cloud of superheated particles rocketing toward Earth. The solar eruption, known as a coronal mass ejection (CME), occurred at 4:24 a.m. EDT (0824 GMT) Tuesday and blasted billions of tons of solar particles toward Earth at a mind-boggling speed of 2 million mph (3.3 million km/h). "Experimental NASA research models, based on observations from NASA's Solar Terrestrial Relations Observatory, show that the CME left the sun at speeds of around 570 miles per second, which is a fairly typical speed for CMEs," NASA officials wrote in an update today. NASA's twin Stereo spacecraft and the Solar and Heliospheric Observatory, operated by NASA and the European Space Agency, captured photos of the solar storm from space. The SOHO LASCO C3 instrument captured this coronographic image of the Earth-directed CME. Notice how the CME appears as a halo around the sun. This is indicative of an Earth-directed event. Image obtained August 20, 2013. The particles ejected by Earth-directed CMEs typically take two or three days to reach our planet, at which point they can trigger geomagnetic storms that can disrupt radio communications, GPS signals and power grids. "In the past, geomagnetic storms caused by CMEs of this strength have usually been mild," NASA officials wrote. CMEs that hit Earth can also ramp up the auroras, also known as the northern and southern lights. In fact, an enhanced auroral display may be on tap tonight and tomorrow for some skywatchers, thanks to a CME that erupted on Saturday (Aug. 17). The cloud from the Aug. 17 CME is not expected to slam directly into Earth, but our planet will likely cruise through the cloud's wake after it passes by, experts said. "This could trigger polar geomagnetic storms despite the CME being off-target," the website SpaceWeather.com reported today. "High-latitude sky watchers should be alert for auroras on August 20-21." The sun is reaching the peak activity phase of its current 11-year cycle, which is known as Solar Cycle 24. Solar Cycle 24's maximum is shaping up to be the weakest of the last 100 years or so, scientists say, with relatively few powerful solar flares, CMEs and other big space weather events. Editor's note: If you snap an amazing picture of the northern lights or any other night sky sight that you'd like to share for a possible story or image gallery, send photos, comments and your name and location to Managing Editor Tariq Malik at spacephotos@space.com.